Tax Groups are useful in setting up sets of taxes so they may be applied to freight and customers appropriately. 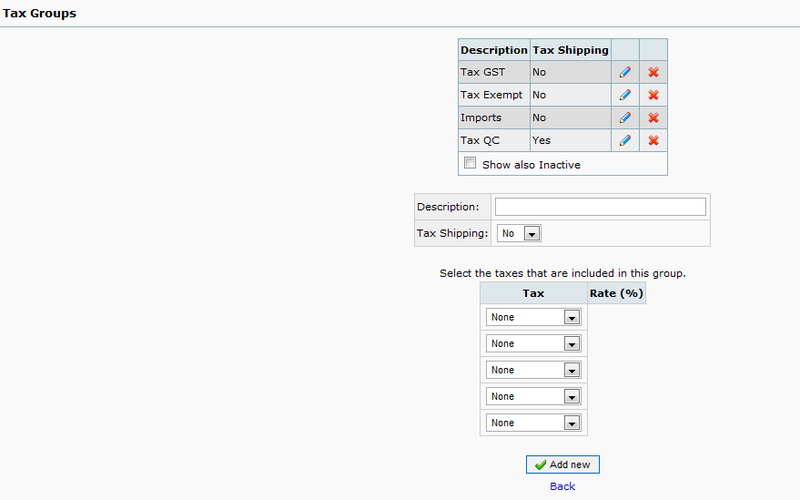 Create Tax Groups which define which tax rates are applicable to customers in given group. The Tax Shipping flag signifies which tax group should be applied to shipping for billing purposes. Only one group may be designated for shipping at a time. For example, lets say we have two taxes. We have a Good's and Services Tax (GST) and a State/Provincial Sales Tax (PST). Local customers are charged both taxes. Out of state/province customers, or those with special PST exemption, are only charged GST. International/out of country customers pay no taxes. Freight, on the other hand, can only be charged GST as it is exempt from our state/provincial tax. Tax Groups are not accessible by default, even by the super-admin. In order to enable it, you must go to Access Setup under the Setup tab, select the user group you wish to change and tick the box corresponding to Tax Groups. In order for this change to take effect, you must log out and log back in. In 2017, Colombia had a VAT increase. In 2018, South Africa (RSA) increased VAT from 14% to 15%. Create a new tax and apply it from the changeover date. The old VAT rate was renamed and in time was marked as inactive. There were no issues as each tax is distinct, so as far as credit notes, the tax rate that was applicable was applied. Each item has a tax type assigned to it, this remains the same. Previous created invoices remained at old rate. Credit Notes issued for old invoices remain at old rate.